کوشا, مسعود, فرهادیان, امیدوار, درافشان, سالار, محبوبی صوفیانی, نصرالله. (1394). بررسی سینتیک و ماهیت جذب مالاشیت گرین توسط ریزجلبک‌های سبز. مجله آب و فاضلاب, 26(3), 37-50. مسعود کوشا; امیدوار فرهادیان; سالار درافشان; نصرالله محبوبی صوفیانی. "بررسی سینتیک و ماهیت جذب مالاشیت گرین توسط ریزجلبک‌های سبز". مجله آب و فاضلاب, 26, 3, 1394, 37-50. کوشا, مسعود, فرهادیان, امیدوار, درافشان, سالار, محبوبی صوفیانی, نصرالله. (1394). 'بررسی سینتیک و ماهیت جذب مالاشیت گرین توسط ریزجلبک‌های سبز', مجله آب و فاضلاب, 26(3), pp. 37-50. کوشا, مسعود, فرهادیان, امیدوار, درافشان, سالار, محبوبی صوفیانی, نصرالله. بررسی سینتیک و ماهیت جذب مالاشیت گرین توسط ریزجلبک‌های سبز. مجله آب و فاضلاب, 1394; 26(3): 37-50. در مطالعه حاضر، تأثیر چهار فاکتور اصلی غلظت اولیه مالاشیت گرین، pH اولیه محلول حاوی مالاشیت گرین، وزن زی‌توده جلبک‌ها و مدت زمان انجام آزمایش بر روی راندمان جذب مالاشیت گرین توسط ریزجلبک‌های سبز سندسموس و کلرلا با استفاده از روش باکس- بنکن مورد ارزیابی قرار گرفت. حداکثر راندمان جذب زیستی مالاشیت گرین توسط ریزجلبک‌های سبز سندسموس و کلرلا به‌ترتیب 23/76 و 32/91 درصد بود. 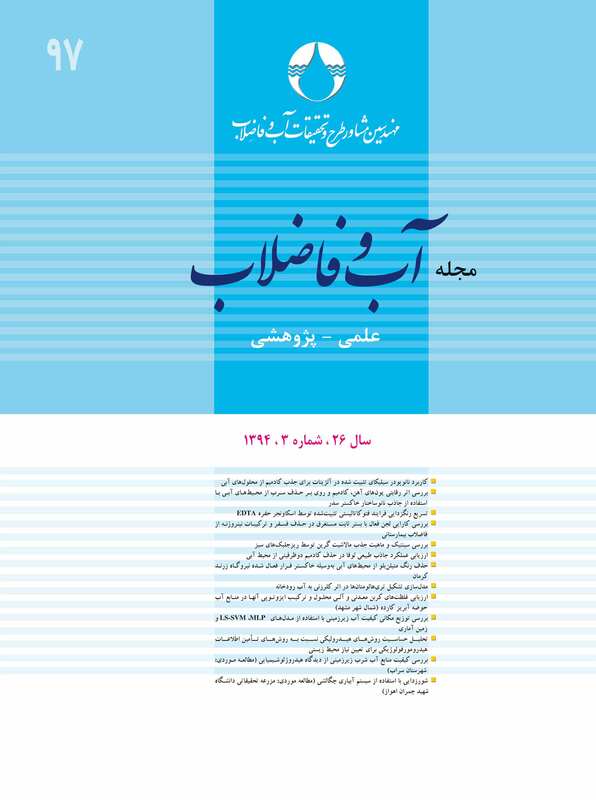 در شرایط بهینه، مدل شبه‌‌درجه دوم بهترین تناسب را با داده‌های آزمایش نسبت به سایر مدل‌ها نشان داد (99/0<). روش اسپکتروسکوپی مادون قرمز نشان داد که چندین گروه عاملی، به‌خصوص گروه‌های کربوکسیل، هیدروکسیل و آمین در سطح زی‌توده‌های جلبکی، مسئول اتصال یون‌های مالاشیت گرین به سطح جلبک‌ها در فرایند جذب زیستی هستند. علاوه بر این، تفاوت راندمان‌های حدف مالاشیت گرین توسط زی‌توده‌های جلبکی، می‌تواند ناشی از تفاوت در برخورد بین مولکول‌های رنگی و زی‌توده‌های جلبکی باشد. این یافته‌ها نشان داد که زی‌توده‌های جلبکی می‌توانند به‌عنوان مواد زیستی مناسب برای جذب زیستی مالاشیت گرین از پساب استفاده شوند. In the present study, the Box-Behnken design was used to investigate the effects of the four main parameters of initial Malachite green )MG( concentration, initial solution pH, algae content, and contact time on the efficiency of dye biosorption by the green microalgae Scenedesmus quadricauda and Chlorella vulgaris. The results showed that maximum dye removal efficiencies of S. quadricauda and C. vulgaris biomasses for the biosorption of MG were 76.23 and 91.32%, respectively. Under optimum conditions, the pseudo-second order fitted with the experimental data much better than other similar models (R2>0.99). The FT-IR spectroscopy method showed that several functional groups, especially carboxyl, hydroxyl, and amine groups, present on the surface of the S. quadricauda and C. vulgaris biomasses are responsible for binding of MG ions in the biosorption process. The differences observed in the MG biosorption efficiencies of algal biomasses may be attributed to differences in interactions between the dye molecules and the algal biomasses. Finally, the findings revealed that the algal biomasses used in this study are suitable as the biomaterial for MG biosrption from wastewaters. Gupta, V.K., and Suhas, S. (2009). “Application of low-cost adsorbents for dye removal a review.” J. of Environment Management, 90, 2313-2342. Culp, S.J., and Beland, F.A. (1996). “Malachite green: A toxicological review.” J. of Amercan College Toxicology, 15, 219-238. Cheng, R., Jiang, Z., Ou, S., Li, Y., and Xiang, B. (2009). “Investigation of acid black 1 adsorption onto amino-polysaccharides.” J. of Polymer Bulletin, 62, 69-77. Srivastava, S., Sinha, R., and Roy, D. (2004). “Toxicological effects of malachite green.” J. of Aquatic Toxicology, 66, 319-329. Parshetti, G., Kalme, S., Sartale, G., and Govindwar, S. (2006). “Biodegradation of malachite green by Kocuria rosea MTCC 1532.” J. of Acta Chimica Slovenica, 53, 492-498. Kaushik, P., and Malik, A. (2009). “Fungal dye decolourization: recent advances and further potential.” J. of Environment International, 35, 127-141. Forgacs, E., Cserhati, T., and Oros, G. (2004). “Removal of synthetic dyes from wastewaters: A review.” J. of Environment International, 30, 953-971. Mondal, S. (2008). “Methods of dye removal from dye house effluent an overview.” J. of Environmental Engineering Sciences, 25, 383-396. 9- Ertugrul, S., Sam, N.O., and Donmez, G. (2009). “Treatment of dye (Remazol Blue) and heavy metals using yeast cells with the purpose of managing polluted textile wastewaters.” J. of Ecological Engineering, 35, 128-134. 10. Volesky, B., and Holan, Z.R. (1995). “Biosorption of Heavy Metals.” J. of Biotechnology Progress, 11, 235-250. 11. Aleboyeh, A., Kasiri, M.B., Olya, M.E., and Aleboyeh, H. (2008). “Prediction of azo dyedecolorization by UV/H2O2 using artificial neural networks.” J. of Dyes and Pigments, 77, 288-294. 12. Khataee, A.R. (2009). “Photocatalytic removal of C.I. basic red 46 on immobilized TiO2 nanoparticles: Artificial neural networkmodeling. ” J. of Environmntal Technology, 30, 1155-1168.
a review. ” J. of Bioresource Technology, 58, 217-227. 15. Tahir, S.S., and Rauf, N. (2006). “Removal of a cationic dye from aqueous solutions by adsorption onto bentonite clay.” J. of Chemosphere, 63, 1842-1848. 16. Tunali, S., Akar, T., Özcan, A.S., Kiran, I., and Özcan, A. (2006). “Equilibrium and kinetics of biosorption of lead(II) from aqueous solutions by Cephalosporium aphidicola.” J. of Seperation and Purification Technology, 47, 102-109. 17. Bellinger, E.G., and Sigee, D.C. (2010). Freshwater algae identification and use as bioindicators, John Wiley and Sons, Ltd., Pub., USA. 18. Kumar, K.V., Ramamurthi, V., and Sivanesan, S. (2006). “Biosorption of malachite a greencationic dye onto Pithophora sp., a fresh water algae.” J. of Dyes and Pigments, 69, 74-79. 19. Jabasingh, S.A., and Pavithra, G. (2010). “Response surface spproach for the biosorption of Cr6+ ions by Mucor racemosus.” J. of Clean, 38, 492-499. 22. Bekci, Z., Sekia, Y., and Cavas, L. (2009). “Removal of malachite green by using an invasive marine algae Caulerpa racemosa var. clyndracea.” J. of Hazardous Materials, 161, 1454-1460. 23. Tsai, W.T., and Chen, H.R. (2010). “Removal of malachite green from aqueous solution using low-cost chlorella-based biomass.” J. of Hazardous Materials, 175, 844-849. 25. Singh, R., Chadetrik, R., Kumar, R., Bishnoi, K., Bhatia, D., Kumar, A., Bishnoi, and Singh, N. (2010). “Biosorption optimization of lead (II), cadmium(II) and copper(II) using response surface methodology and applicability in isotherms and thermodynamics modeling.” J. of Hazardous Materials, 174, 623-634. 26. Lagergren, S. (1898). “Zur theorie der sogenannten adsorption geloster stöffe, Kungliga Sevenska Vetenskapsakademiens. ” Handlingar 24, 1-39. 27. Ho, Y.S., and McKay, G. (1999). “Pseudo-second order model for sorption processes.” J. of Process Biochemistry, 34, 451-465. 28. Weber, W.J., and Morris, J.C. (1963). “Kinetics of adsorption on carbon from solution.” J. of Sanitary Engineering. ” J. of Div., 89, 31-59. 29. Zarei, M., Salari, D., Niaei, A., and Khataee, A.R. (2010). “Application of response surface methodology for optimization of peroxi-coagulation of textile dye solution using carbon nanotube-PTFE cathode.” J. of Hazardous Materials, 173, 544-551. 30. Bezerra, M.A. (2008). “Response surface methodology (RSM) as a tool for optimization in analytical chemistry.” J. of Talanta, 76, 965 - 977. 31. Santos, S.C.R., and Boaventura, R.A.R. (2008). “Adsorption modelling of textile dyes by sepiolite.” J. of AppliedClay Science, 42, 137-145. 32. Donmez, G.C., Aksu, Z., Ozturk, A., and Kutsal, T. (1999). “A comparative study on heavy metal biosorption characteristics of some algae.” J. of Process Biochemistry, 34, 885-892. 33. Goldacre, R.J., and Philips, J.N. (1949). “The ionization of basic triphenylmethane dyes.” J. of the Chemical Society, 11, 1724-1732. 34. Crini, G., Peindy, H.N., Gimbert, F., and Robert, C. (2007). “Removal of C.I. Basic Green 4 (malachite green) from aqueous solutions by adsorption using cyclodextrin -based adsorbent: kinetic and equilibrium studies.” J. of Separation and Purification Technology, 53, 97-110. 35. Mehta, S.K., and Gaur, J.P. (2005). “Use of algae for removing heavy metal ions from wastewater: Progress and prospects.”J. of CriticalReviews inBiotechnology, 25, 113-152. 36. Selatnia, A., Boukazoula, A., Kechid, N., Bakhti, M.Z., and Chergui, A. (2004). “Biosorption of Fe3+ from aqueous solution by a bacterial dead Streptomyces rimosus biomass.” J. of Process Biochemistry, 39, 1643-1651. 37. Nadeem, R., Ansari, T.M., and Khalid, A.M. (2008). “Fourier transform Infrared spectroscopic characterization and optimization of Pb(II) biosorption by fish (Labeo rohita) scales.” J. of Hazardous Materials, 156, 64-73. 38. Akar, T., and Tunali, S. (2005). “Biosorption performance of Botrytis cinerea fungal byproducts for removal of Cd(II) and Cu(II) ions from aqueous solutions.” J. of Minerals Engineering, 18, 1099-1109. 39. Wang, X.S. (2010). “Invasive freshwater macrophyte alligator weed: Novel adsorbent for removal of malachite green from aqueous solution.” J. of Water, Air and Soil Pollution, 206, 215-223. 40. Jadhav, J.P., and Govindwar, S.P. (2006). “Biotransformation of malachite green by Saccharomyces cerevisiae MTCC 463.” J. of Yeast, 23, 315-323. 41. Rajeshkannan, R., Rajasimman, M., and Rajamohan, N. (2010). “Removal of malachite green from aqueous solution using Hydrilla verticillata: Optimization, equilibrium and kinetic studies.” Int. J. of Civil Environment Engineering, 2, 222-229. 42. Mittal, A. (2006). “Adsorption kinetics of removal of a toxic dye, malachite green, from wastewater by using hen feathers.” J. of Hazardous Materials, 133, 196-202. 43. Khattri, S.D., and Singh, M.K. (2009). “Removal of malachite green from dye wastewater using neem sawdust by adsorption.” J. of Hazardous Materials, 167, 1089-1094. 44. Zhang, J., Li, Y., Zhang, C., and Jing, Y. (2008). “Adsorption of malachite green from aqueous solution onto carbon prepared from Arundo donax root.” J. of Hazardous Materials, 150, 774-782. 45. Onal, Y., and Sancr-Ozdernir, C. (2007). “Investigation kinetics mechanisms of adsorption malachite green onto activated carbon.” J. of Hazardous Materials, 146, 194-203.